Made by Churchill & designed by Jeff Banks, this is ' Herat ' from the Ports of Call range (the yellow & blue pattern). MASONS REGENCY PLATES - 2 PLATES. 9 INS. GOOD USED CONDITION. NO DAMAGE. This can be seen in photograph 3 where the left-hand plate has deeper colours than the right. Both plates backstamped. CHURCHILL Ports of Call – Morocco by Jeff Banks. 6 x Rose Bouquet Royal Victoria Saucers. Blue & White. Very good condition. Moorlands Spongeware Toast Rack - GREEN FROG. Spongeware by Moorlands, Staffordshire, Chelsea Works, Burslem. Really Pretty Pottery/Ceramic Toast Rack. Green Frog on Each End. Sponged Green and Blue Pattern on Top. Condition is Used. MADE IN ENGLAND. THERE IS A TRADE MARK & THE NUMBER 314 ON THE BOTTOM. New listingLARGE COW MILK/CREAM JUG.. STAFFORDSHIRE.. CHRISTOPHER WREN.. NICE CONDITION..
### STAFFORDSHIRE CHRISTOPHER WREN ###. ### IN VERY NICE CONDITION ###. New listingSMALL COW MILK/CREAM JUG.. STAFFORDSHIRE.. CHRISTOPHER WREN.. NICE CONDITION.. Height of pot without lid 7.5cm. 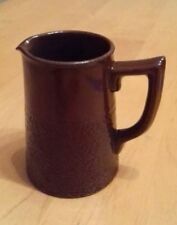 4" H&K TUNSTALL VIOLA JUG. 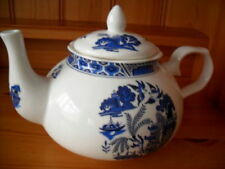 Made by Barker Bros Ltd. Blue & White Floral. Back stamped with ‘England’ on base. Colour and pattern clear & bright. Pre owned & used - light crazing evident. Small area of rough glaze on inside of jug handle on lower curve - functionality not affected. Max height - Approx 11.5cm. Churchill tea set 25 Piece .Indian Tree design .. excellent condition..
DEBENHAMS MARLFIELD SUGAR & CREAMER BY NORITAKE EXCELLENT CONDITION. Box is tatty (please see pics) Sugar height with lid 14cms approx, creamer height 11cms approx. Thanks for viewing. Made in the 60s 70s in Staffordshire. However despite this, the odd small mark etc could be missed. I describe every item as best I can and we point out any significant imperfections that have been identified. Manufacturer :- Staffordshire tableware Oakwood. 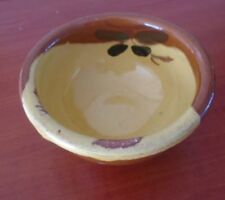 Shape :- Soup, Fruit, Dessert bowls. Year :- 1990s. Tableware Object :- 4 bowls. With which to grace a. This is an excellent Pattern. A few light marks from use. size approx 140mm wide handle - handle x 67mm high. Decorative Aztec Design. Width 17 cms. 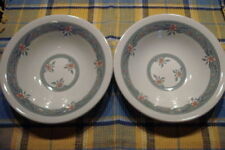 White Soup/Dessert Bowls. 2Collectable Ceramic. 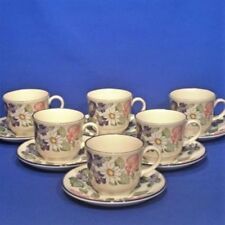 This listing is for 4 x North Staffordshire Pottery, Vitrock, Orient Line tea/sandwich/cake/side plates. Each of these plates has a 16.5cm diameter x 1.6cm depth - North Staffordshire pottery - calico cream coloured Vitrock Ceramic with shell design - Orient Line - in lovely used condition, there are expected age related/usage marks to these plates - please see photographs! Nevertheless, these are lovely, perfectly usable vintage plates! I will dispatch these plates via courier (MyHermes) to allow for plenty of packaging! Please see my other items - i will combine postage! Liberty Blue Colonial Scenes Betsy Ross Berry Bowl Staffordshire 5"
Genuine English Cream Ware Ceramic Jar with Lid Made in Stoke on Trent England. Antique A.S. Burbank Souvenir Blue Staffordshire England Plate Plymouth, MASS.